I started off yesterday with The Eye. I'll be watching at least the two Rest Stop movies today. I have the two Rest Stop movies to watch also. But I will have to save those for another day since I am doing TV Movies today. Have you seen them before Hal? I will be interested in your thoughts on them. No, I've never seen them. I'll be posting reviews. Review for Rest Stop: Dead Ahead posted. This is based on a novel by early science fiction writer H.G. Wells. It is about a scientist who discovers a way to turn himself invisible...but he hasn't found an antidote and the chemicals he has given himself are driving him insane and he runs amuck in a British countryside village. This is probably more science fiction than horror but I still enjoy watching it this time of year as the wintry landscape evokes a similar feel to some other classic scary movies though it doesn't quite reach that level, but Una O'Connor certainly gives us her best screaming fits. I enjoyed the film a great deal and it's ironic that Claude Rains (in one of his earliest roles) is in the entire film without his face actually being seen...until the final shot. I decided to watch this as my first entry in this marathon since the leading lady is Gloria Stuart...who passed away just days ago at the age of 100. She certainly looks nothing here like she did in her great come-back role as the older Rose in "Titanic". She is young and vibrant, a perfect leading lady for such an early time. 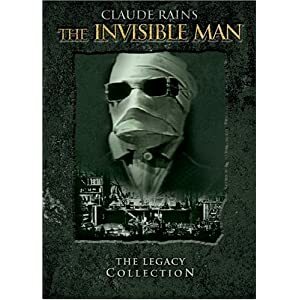 I watched this via the Legacy Collection of The Invisible Man which includes 5 total films, four Invisible Man movies and one Invisible Woman film. The picture and sound quality are first-rate and I highly recommend this film. It's also a very short film...an hour and 11 minutes. They don't make 'em that short anymore! I plan on doing a few days of the old Universal Monster movies through-out the month. Review for Rest Stop: Don't Look Back posted. Thanks for the reviews Hal! I will go into these not expecting a whole lot. Who knows... maybe I will enjoy them a little more. I warned you that this genre was not my cup of tea...so you may love them! Watching Hostel and Hostel 2 next. I actually already have something else planned for tomorrow. But I will keep them in mind when I have a gore-fest day! I've posted about what I've watched so far. Well..almost all. I did finish watching a disc of Scooby-Doo cartoons. I'll probably wait and post after I finish all the episodes on that one. I was wondering about that a little myself. I thought a few more were going to take part anyway.